What is the Razer Goliathus Chroma? The Razer Goliathus Chroma is our bestselling soft gaming mouse mat that is now ready to illuminate every victory in a stunning spectrum of colors. When and where will the Razer Goliathus Chroma Extended be available? The Goliathus Chroma Extended is available now at the RazerStore.com. To find an authorized reseller in your area please visit https://www.razer.com/store-finder. What type of connection does the Razer Goliathus Chroma Extended have? The Razer Goliathus Chroma Extended uses a standard USB Type A connector to support the Chroma lighting feature. What type of surface does the Razer Goliathus Chroma Extended have? The Goliathus Chroma Extended features an optimized micro-textured cloth surface to allow for both speed and control playstyles. What are the dimensions for the Razer Goliathus Chroma Extended? Approximate weight (excluding cable): 560 g / 1.23 lbs. 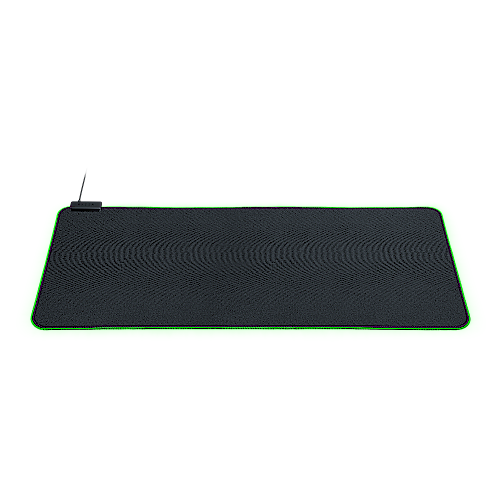 How do I clean the Razer Goliathus Chroma Extended mouse mat? Please make sure that your Razer Goliathus Chroma Extended is unplugged from your computer before you clean the mat. Gently shake out any dust first, then use a damp cloth to wipe the surface down. Will the Razer Goliathus Chroma Extended be available in other surface types? The Razer Goliathus Chroma Extended are currently only available with the optimized micro-textured cloth surface. My Razer Goliathus Chroma Extended isn’t perfectly flat out of the box. Is this normal? Yes, when unboxing your Razer Goliathus Chroma Extended for the first time, the mat needs to rest flat on your desktop surface for 24 hours before it fully flattens out. You may place a book or similar flat object on the surface to help it flatten. However, please do not try to stretch it manually and make sure to not place any heavy weight on the lighting frame. How do I care for the Razer Goliathus Chroma Extended? Keep the device away from liquid, humidity, or moisture. Operate the device only within the specific temperature range of 0°C (32°F) to 40°C (104°F). Should the temperature exceed this range, unplug and/or switch off the device in order to let the temperature stabilize to an optimal level. How can I clean my Razer Goliathus Chroma Extended mouse mat? Is it safe to machine wash? The Razer Goliathus Chroma Extended requires minimum maintenance to keep it in optimum condition. Once a month we recommend you unplug the device from the computer and clean it using a soft wet cloth or cotton swab with a bit of warm water, slowly clean with the gradient to prevent dirt buildup. Which version of Synapse supports the Razer Goliathus Chroma Extended? The Razer Goliathus Chroma Extended is only supported by Synapse 3. What are the system requirements for the Razer Goliathus Chroma Extended? What games are best suited to use with the Razer Goliathus Chroma Extended? Razer Chroma is the world’s only immersive lighting platform with over a hundred natively integrated games - some of the world’s top AAA games have integrated Razer Chroma lighting, including “Overwatch” from Blizzard, “Call of Duty®: Black Ops 3” from Activision, “Shadow Warrior 2” from Devolver Digital, Fortnite, Quake Champions™, Diablo™ and other popular games. Check out this link for a list of current Razer Chroma-integrated games that have integrated Chroma Lighting effects, find Chroma Apps and upload user-created Chroma profiles. We're certain you'll find a Chroma integrated game that you'll like. What other Razer products can the Razer Goliathus Chroma Extended synchronize to? The Razer Goliathus Chroma Extended can synchronize to all Razer Synapse 3 enabled products. How do I control or change the settings of my Razer Goliathus Chroma Extended? To change the settings of your Razer Goliathus Chroma Extended – including changing lighting, macros, and other functions, please download and install Razer Synapse 3. What Chroma effects are available for the Razer Goliathus Chroma Extended? All Chroma effects are available except for the wave (Inter-device wave synchronization is available). What is the warranty for the Razer Goliathus Chroma Extended? Please refer to https://www.razer.com/warranty for all warranty periods and other warranty terms. Should you need any further assistance, you may also contact the Razer Support Team by visiting http://support.razerzone.com/contact-support.